On Friday 5th June the 6th Class pupils were awarded their Blue Flag. This was the culmination of a very successful year’s project work based on the Blue Star programme. 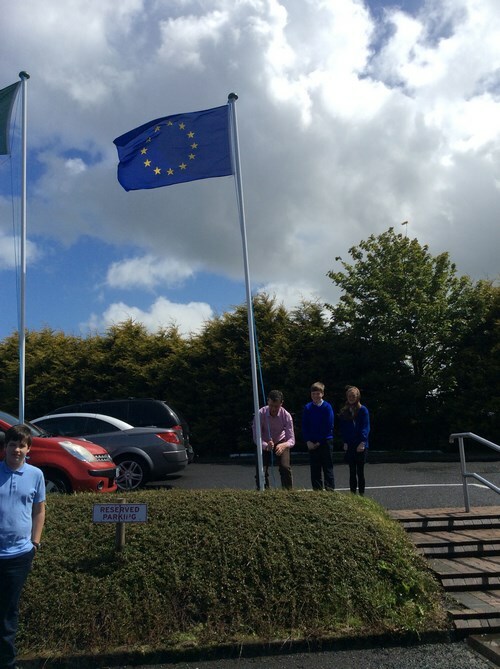 The aim of this programme is to foster better knowledge and understanding of the European Union and how it affects our lives amongst Irish primary pupils through classroom projects and activities. On Europe Day the pupils gave a presentation of their work to the whole school. In the afternoon parents visited the school to view the presentations and enjoy some excellent performances from the school band, the school choir and individual pupils. They also had an opportunity to sample foods from various European countries. Thanks to Mr.Donnellan who co-ordinated the Blue Star project and to all the staff members who helped to make the day a great success.